Our winter Farm to Table dinners are always a challenge. How do we represent the farm in an interesting, delicious, and colorful menu with only cellar veggies? Moreover, how do we do that four or five months in a row? Boiled then broiled then baked then twice-baked potatoes? It helps that Malaika grows year-round greens. This is also when we finally reap the benefits of our September canning kick, a rainbow of summer produce floating in brines and syrups in Ball jars on our walls. Meat-focused dishes help too, our freezers overflowing from fall butchery demos of the great livestock and game from surrounding farms and fields. Slowly cooked, roasted or braised, they provide the umami-rich warmth and sustenance we’re looking for to warm us against the winter cold. 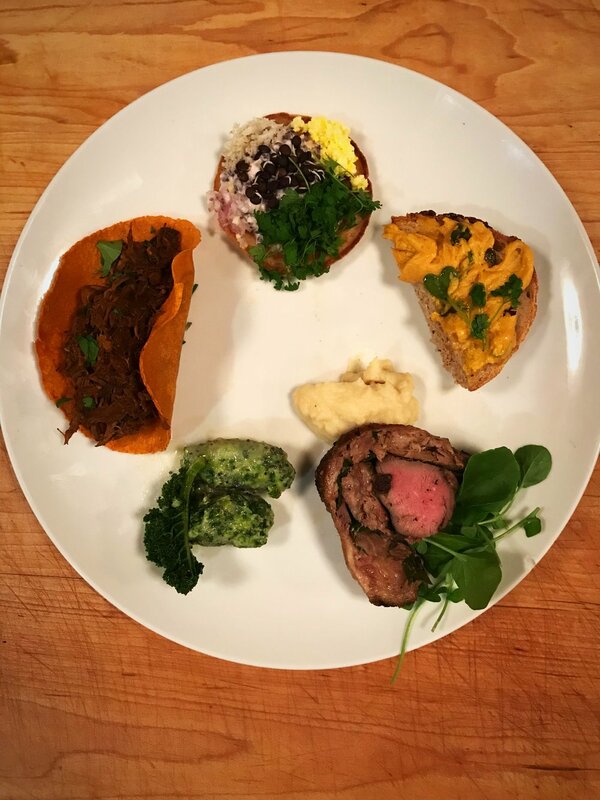 What follows is my interpretation of a Mexican barbacoa which I prepared with venison for this weekend’s Farm to Table dinner. Barbacoa is a pit-style of cooking originating in the Caribbean and the linguistic and culinary origin of our barbecue. Like our barbecue, barbacoa refers to a general practice of cooking and takes on many different forms from region to region. Traditionally though, the dish called barbacoa involves the slow steaming of goat or lamb in mixiote (the leaves of the agave plant) or banana leaves over heated stones in the earth. After hours of slow roasting, the meat, rubbed brick-red with adobo, emerges dark, succulent, and lightly charred where exposed to the direct heat through the leaves, which for their part, imbue the whole affair with subtle grassy notes. But wait, there’s more! Barbacoa is typically steamed atop a soup pot, filled with stock vegetables, rice, and garbanzo beans. The meat and adobo drippings are captured in the pot over the hours-long cook time creating a heady broth licked with smoke and glistening with beads of fat. Finally, all is removed, the meat shredded, moistened with some of the broth, and served on tortillas accompanied by a steaming styrofoam cup of the soup and a cold beer. Make this, and never balk at a $4 taco again. With much credit owed to Maricel Presilla and her indispensable Gran Cocina Latina, as well as to Ian and Shelley, as always, I adapted this traditional pit-cooking method to our wood-fired oven at the school (and below, you’ll find the same recipe utilizing Maricel’s technique for the home kitchen). Venison I thought, of which we have plenty (and happened to have a short neck perfect for a long cook), represented a nice analog to its more traditional cloven-hooved, grass chewing brethren, but feel free to sub in tough cuts of goat or lamb (or even beef) if you prefer. And inspired by this deer adaptation, I incorporated some spices less typically seen in Mexican adobos, including mint, juniper, allspice, clove, and bay. Finally, Shelley helped me to develop the tortillas which are flavored with guajillo and, again, allspice. I found the hint of allspice nicely brought out the same in the barbacoa, but this infusion step is skippable. That said, homemade tortillas are essential, flavored or not. Rinse chiles under running water to remove any dust or dirt. Once rinsed, place them in a small saucepan with 1 cup water, bring to a boil over medium-high heat, and cook for 3 minutes. Set aside. While chiles are steeping, heat a griddle or heavy skillet over medium-high heat. Add the mint, cumin, allspice, juniper, cloves, marjoram, thyme, bay leaf, and cinnamon and toast, stirring frequently to prevent scorching, until fragrant (about 40 seconds). Let cool and, using a spice grinder or mortar, grind into a fine powder. Place the chiles with their steeping liquid, ground spices, garlic, salt, and cider vinegar into a blender and process into a fine puree. Makes about 2 cups. Place the meat in an even layer across the bottom of a large container. Liberally season with salt and rub on the adobo, being sure to cover all sides of the meat. Cover with plastic wrap (pressing directly onto the surface of the meat) and let rest in the refrigerator for a minimum of 6 hours and no more than 24. If using a grill: Preheat your grill to 500˚. Place stock vegetables (carrot, garlic, onion) and rice in a shallow 12 to 14 inch pot. Cover with water for broth. Line a wire rack just bigger than the width of your pot (12-15 inches) with an overlapping layer of banana leaves. Place the marinated meat in the center of the leaves. 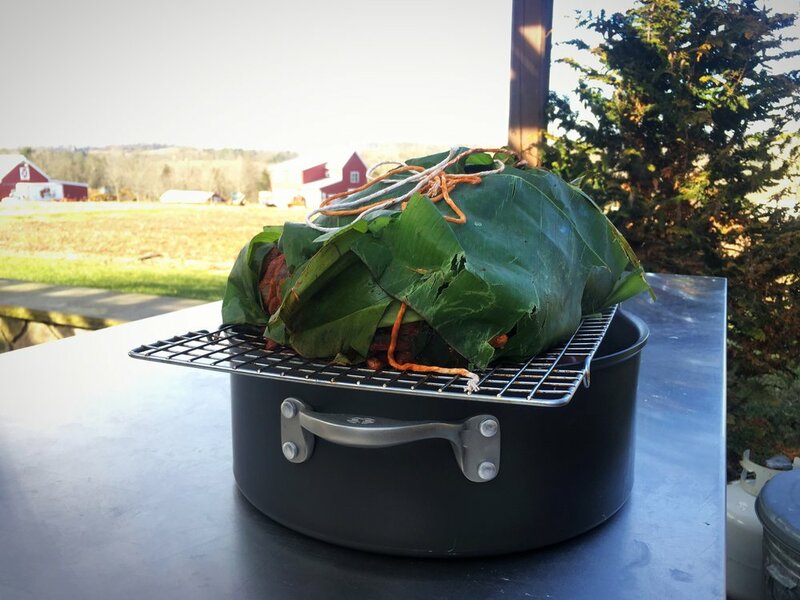 Wrap the meat by folding the exposed edges of the leaves over the top and using additional leaves if necessary. Tie the entire bundle with kitchen twine or secure the leaves with toothpicks if they seem likely to come undone. Place the entire rack on top of your broth pot and cover the whole set-up (wrapped meat, wire rack, and pot) securely with tinfoil. Once your grill is heated and your cooking vessel is prepared, create a ring of coals or wood with a space in the middle. Using oven mitts, nestle your pot snugly into this hole amongst the coals (if using a gas grill, simply place your pot on the rack). Cover and cook 3 to 4 hours until the meat is fork-tender and falling off the bone. You want to maintain a temperature of about 350˚ over the duration of your cooktime, so add wood or charcoal as necessary. If using the stovetop (Maricel Presilla’s Technique): Place 2 cups water for broth in a 12-quart stockpot about 12 inches in diameter. Place a 3-quart pot inside the larger pot, and add to the smaller pot the rest of the water, carrot, garlic, onion, and rice. Place a colander 10 to 11 inches in diameter on top of the smaller pot. Singe your banana leaves by running each side over a gas flame or an electric burner set on high for a few seconds. Line your colander with an overlapping layer of the leaves, being sure to cover all gaps and leaving the edges of the leaves extended beyond the rim. 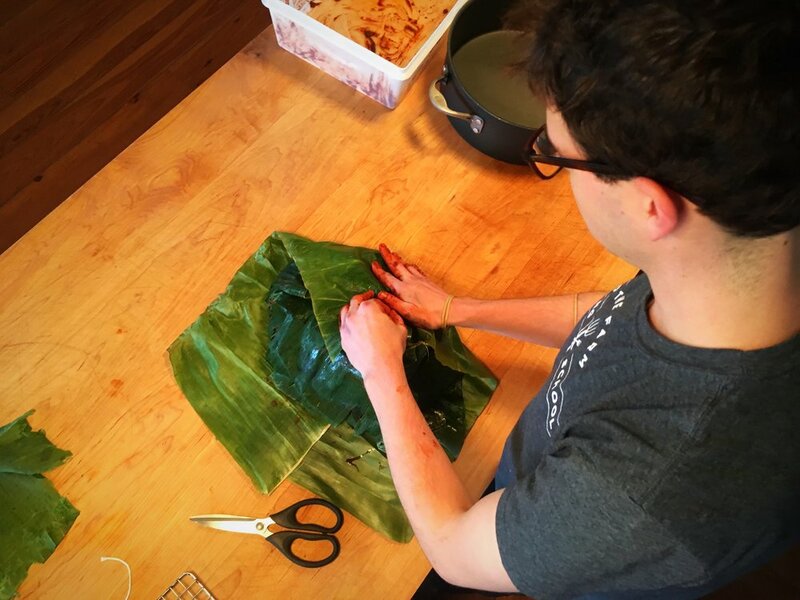 Arrange the marinated meat in the colander and wrap by folding the exposed banana leaves over the top (use additional banana leaves to cover if necessary). Dampen a clean kitchen towel and place over the colander. Cover the larger pot with a tight-fitting lid. Cook over medium heat until the meat is fork-tender, about 3 hours. While cooking, the contents of the smaller pot will spill into the larger stockpot. When the meat is tender and pulling away from the bone, remove it from on top of the pot and allow to cool slightly. If using the grill: Remove the soup pot to the stovetop. Continue simmering the broth to concentrate the flavors and reduce as desired. Salt to taste and keep warm over low heat. If using the stovetop: Lift out the smaller pot and pour its contents into the larger pot. Continue simmering the broth to concentrate the flavors and reduce as desired. Salt to taste and keep warm over low heat. When the meat is cool enough to handle, shred it finely and moisten with one or two ladlefuls of the broth as necessary. Mound the meat onto a serving platter and sprinkle with cilantro. Serve the broth separately in small bowls or glasses. Serve with guajillo-allspice tortillas (see recipe below), diced white onion, and wedges of lime. 3 guajillos, stemmed, seeded, and soaked in warm water approximately 10 min. Blend the salt, soaked guajillos, garlic clove, and allspice berries with 1½ cups hot water (reserving the remaining ¼ cup water to further moisten the dough if necessary). Combine the tortilla flour and guajillo-allspice liquid in a large bowl and knead with your hands until a uniform dough forms (1 to 2 minutes). Dough should be moist, but just stiff enough to form into a ball. If necessary, knead the reserved water into the dough a teaspoon at a time. Dough will dry out as it sits, so cover with a piece of plastic wrap as you work. Heat a flat griddle over medium heat until hot. Prepare your tortilla press by covering the faces with rounds cut from a plastic bag to prevent your tortillas from sticking. Pinch off 10 grams of dough and form a ¾-inch ball. Using consistent and even pressure, press the ball of dough between the plastic rounds in the tortilla press to form the tortilla. Peel off 1 plastic round, then, holding the tortilla over the edge of your palm, carefully peel off the other round so the tortilla is dangling from your palm. Transfer the tortilla to the griddle by letting the dangling edge touch the surface and slowly pulling your hand back as you lay the tortilla down on the griddle. Cook until the edges just lift slightly from the griddle, about 15 seconds. Turn over (you can lift the edge of the tortilla with a butter knife or spatula to help you but then grab it with your fingers and flip it over). Cook until a few faint brown spots appear on the underside, about 45 seconds. Turn over once more. As the tortilla begins to inflate slightly (this may not always happen), press down on the bubble with your spatula to force the air into other pockets of the tortilla. Once small brown spots appear on the second side, 30 to 45 seconds, transfer the tortilla to a cloth-lined tortilla basket to keep warm as you make more tortillas. Cooked tortillas should be eaten while they are still warm. To make in advance, stack tortillas and place in a ziploc bag (the steam will help to keep them fresh). When ready to serve, remove tortillas from bag and wrap in tinfoil. Reheat in 350˚ oven for 10 to 15 minutes until warmed through.